Bixa orellana-Family: Bixaceae. Common Name: Annatto. Native to tropical rainforest of South America. Dwarf form is best for containers or small yards. Pink blooms followed by red or reddish-orange pods. Seeds are used for natural food coloring and dye. Dwarf form begins to bear at about 16 to 18 months old. Full sun. Keep moist. Rich soil. Mulch and fertilize several times per year for best growth. Camellia sinensisFamily: Camelliaceae. Common Name: Tea. Large shrub with lanceolate serrated leaves. Young leaves are picked and processed to create green, oolong, and black tea. Length of fermentation determines the type of tea. I will have plants ready to ship late 2009. Cinnamomum aromaticum-Syn: Cinnamomum cassia. Family: Lauraceae. Common Name: Chinese cinnamon. Green bark. New growth is red. Reported to be more pungent than true cinnamon. Very fast growing in Hawaii if it is planted in good soil. Full sun. Heavy feeders and are best with regular applications of fertilizer and mulch. Cinnamomum burmannii-Family: Lauraceae. Common Name: Indonesian cassia . This species is native to Indonesia and is used in a similar manner to C. verum and C. Cassia. Green bark on younger stems; thickens and turns brown with age. Larger leaves and faster growth than C. aromaticum. New growth is red. I doubt that this species has much cold tolerance. Full sun. Tropical humid conditions. Cinnamomum verum-Family: Lauraceae. Syn. C. zeylanicum. Common Name: true cinnamon. I believe that the plants that I originally acquired as C. verum are C. iners. Bark is the source of the best cinnamon. Leaves have a distinct cinnamon smell when crushed and can be used like a bay leaf in cooking. Slower growing than the Chinese cinnamon. Costus guanaiensis- Costaceae. Common name: Spiral ginger. Large tropical ginger relative native to South America. Grows well in medium shade to full sun. Keep moist and warm. Does not tolerate frost or prolonged periods below 50 degrees F. The stems are crushed for juice. Elettaria cardamomum- Family: Zingiberaceae. Common Name: Cardamom. Large member of the ginger family grown for its tasty seed pods. The dried green pods are used in curries and deserts. Usually grown in the shade. We notice a bit of sun/wind when grown in full sun. Bloom spike emerges from the ground at the base of the stems. Flowers look like tiny orchids. Individual blooms last only for a day or 2. Macropiper excelsum- Family: Piperaceace. New Zealand Kawakawa. Large shrub. Leaves are used to make a tea. Similar to kava but above ground portions of this species can be used. Seed germination is erratic. Plants are dioecious. Fruit is edible but can have a laxative effect. Reported to tolerate moderate brief frost down to 28F to 29F. I hope to have this plant available starting in late 2015. Myristica fragrans-Family: Myristicaceae. Common Name: nutmeg. Large tree native to tropical Pacific Islands. Glossy thick dark green leaves. Small bell shaped fragrant flowers. Large seeds are the source of nutmeg. Red aril is source of mace. Seems to like rich slighly acid soil and a steady supply of moisture. Begins to bloom at about 5 or 6 years old. Ocotea quixos- Family: Lauraceae. Common Names: ishpingo or Ecuadorian cinnamon. Tree with lanceolate leaves. Slow growing when young. Only about 6 inches a year for the 1st 2 or 3 years. Leaves have a very pleasant smell like Dentene gum. Used in tea and flavoring. Bark can be harvested like cinnamon. Seeds are about 3/4 inch in diameter. Rich slightly acid soil. Rare in the US. This species has been difficult to establish. Young plants seem to drop leaves a couple of times per year. New growth sometimes starts and then dies back. Becomes more robust when about 4 or 5 years old. Once they are about 3 ft. to 4 ft. tall growth becomes more vigorous. Pandanus sp.-Family: Pandanaceae. Common Name: Bai Thuy. Probably Pandanus amaryllifolius. Used in Southeast Asia to flavor rice and curry dishes. Plants have deep green smooth leaves. This species doesn't have spiny leaf margins. Propagated by cuttings which usually root in a few months. We have found that it is best to take cuttings that already have started to form aerial roots. Pimenta dioica- Myrtaceae. Common name: allspice. Small to medium tree. Dried berries are allpsice. Glossy dark greenleaves which are fragrant when crushed. Leaves can be used in rice dishes and currys. Leaves make an excellent addition to marinades. Slow to moderate growth rate depending on your conditions. Piper betel-Family: Piperaceae. Common Name: betle leaf. large cordate leaves are used to wrap a mixture of spices and betel nut in India. Chewed after meals. Meetha pan is a sweet spice mix without the betel nut or tobacco that I prefer. Chewed after meals. Vigorous woody vine or some varieties can be a scandent shrub. I have several selected varieties. One has very strongly scented leaves with a hickory smoke scent when crushed. Rich well drained soil high in organic matter. Shade. Support is required for the vine. If conditions are humid, it will send out roots at each node. Piper methysticum-Family: Piperaceae. Common Name: kava, 'awa. Roots are used to make a beverage. Use only subterranean portions of the roots and stem base. Taste is earthy and peppery. Relaxing and in large quantities intoxicating. Used as a social drink throughout the Pacific basin. Medicinally it is used as antianxiety and antidepressant. Cordate leaves. Stems range from black to light green depending on the cultivar. A number of cultivars have been selected on different islands across the Pacific. They do not produce seeds. Propagated by stem cuttings; woody sections of the stem are covered and will root and send up shoots in about 3 weeks. Many cultivars are suseptible to shot hole disease caused by a fungus. Results in decreased plant vigor and may even kill plants. This can be controled with neem oil, sulfur or several strains of antifungal bacteria. I have several cultivars: Mo'i is a black stemmed Hawaiian strain high in kavalactones. 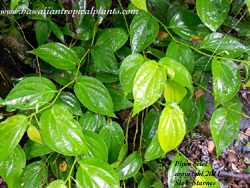 Hiva is another Hawaiian cultivar with black stems; it has longer internodes than Mo'i. Hina is from Tonga and has green stems with dark green raised spots. Rahmadel is a green stemmed Micronesian cultivar. Issa is from New Guinea and is disease resistant. Piper nigrum-Family: Piperaceae. Common Name: black pepper. Dried berries are the source of black pepper. If the seeds ripen and the exterior portion is removed, it is white pepper. Vine with cordate green leaves. Roots will form at each node if the vine touches soil or a porous support such as tree bark. Full sun to light shade. Syzygium aromaticum-Family: Myrtaceae. Common Name: cloves. The dried flower buds are the source of the spice. Trees are densely branched. Plants prefer rich slightly acid soil. Full sun. Blooming begins at about 6 years old. Theobroma cacao-Family: Sterculiaceae. Common Name: Cacao, chocolate. Seeds are roasted and processed to produce chocolate liquor or cocoa powder. Pods ripen to yellow or red. Thin layer of pulp around the seed is edible. Believed to have originated in the Amazon basin. Cultivated in the tropics worldwide now. Prefers some shade. Warm moist growing conditions. Plant in areas protected from wind. Organic fertilizer is best. Over use of chemical fertilizer can burn the plant. Seeds germinate quickly and must be kept moist at all times. Temperatures above 80F are best for germination. Seeds are available when I have ripe pods. Germination begins within a few days. Shipped in moist peat moss; handle carefully to avoid damage to emerging root.